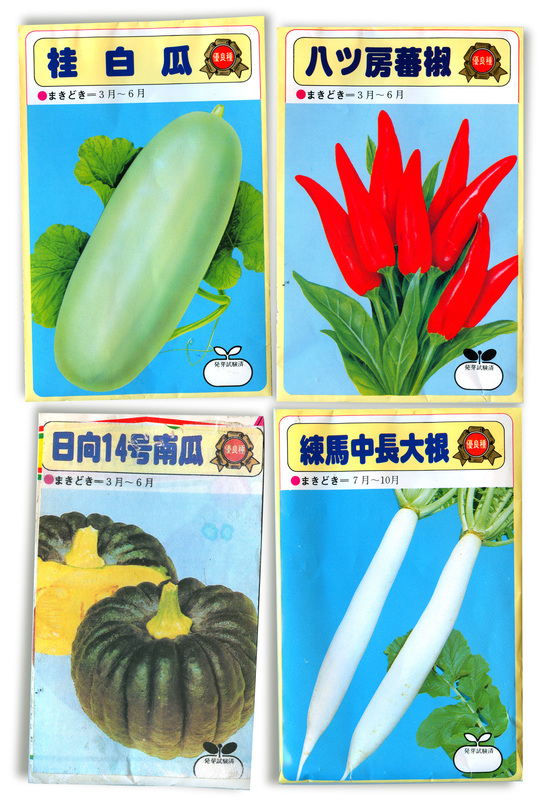 Seed packets are promises of a brighter future. Hold one in your hand and shake it gently: That quiet shhhh-shhhh is the sound of the seeds making promises to you … That if you’re diligent and follow all the rules (conveniently printed on the reverse) you’ll be rewarded with bushels of gorgeous flowers, fruit, or, as in this case, vegetables. Seed packets bring out the commitment-phobe in me. It’s not that I can’t commit because they cost too much, they don’t. It’s that I know I can’t live up to their expectations and I’ll let them down. I won’t water them enough; I’ll plant them in a too-sunny, or not-sunny-enough spot; I won’t spend enough time with them as they grow; I won’t have noticed that I live in the wrong climate zone and sentenced them to a burning death come summer … And, I just can’t do that to them. Oh, I always fall for their cheery faces, so pretty and colorful. And, I love to hold them and hear their whispered promises. But I never buy them. Until these. These I found at Anzen Hardware in LA’s Little Tokyo, a sweet little store that offers traditional Japanese garden and household tools and other items. I went there with a friend on an errand, saw these, and fell hard. These packets not only featured plump, shiny, veggie perfection, they also had a retro graphic punch I couldn’t say no to. The Japanese typography, the overly saturated colors, the little fruit shape for the price, were delightful … So, I bought them all, and told myself I’d share them here. I can’t commit to them beyond this, though, and that’s where you come in. If you live in a climate where these vegetables will grow and thrive, send me your address and I’ll mail you the seed packet. Just tell me which one(s) you’d like, at reubix1@yahoo.com. I’ll feel better knowing that they’ve gone on to someone willing to commit to them; someone who’ll give them what they need to fulfill the promises on their faces. 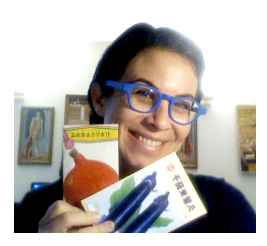 UPDATE: The lovely (and always charmingly bespectacled) Ruth Handel sends along this snap of herself with seed packets for squash and eggplant she requested. The seeds will take root at a Mar Vista elementary school and we can’t wait to see those pics, too! Hi, Guida… I’m hoping you’re all better after the year-end sick-out… I’m happy to say I am! No, I love my veggies but have an aversion to growing them, preferring to leave that to the experts… New scheme’s a-comin’ … next phase: removing in-ground plants. Keep watching! The designs on the packets are fabulous, I can see why you bought them! Excellent find! Next time I’m downtown, Little Tokyo will be on the itinerary. Almost made it to LT over Christmas, to take my nephew to the Blue Whale jazz club, but changed plans last minute. So glad you’re feeling better! I so agree about the appeal of these litle packets of promises. Somewhere around here I think I’ve hidden some older ones. My favorite is one that came from Small’s Nursery. Can’t remember what kind of flowers. The Press Enterprise used to run a gardening column written by Marilyn(?)Small. She inspired me to experment with alot of different plants. I still have a couple three around here still. 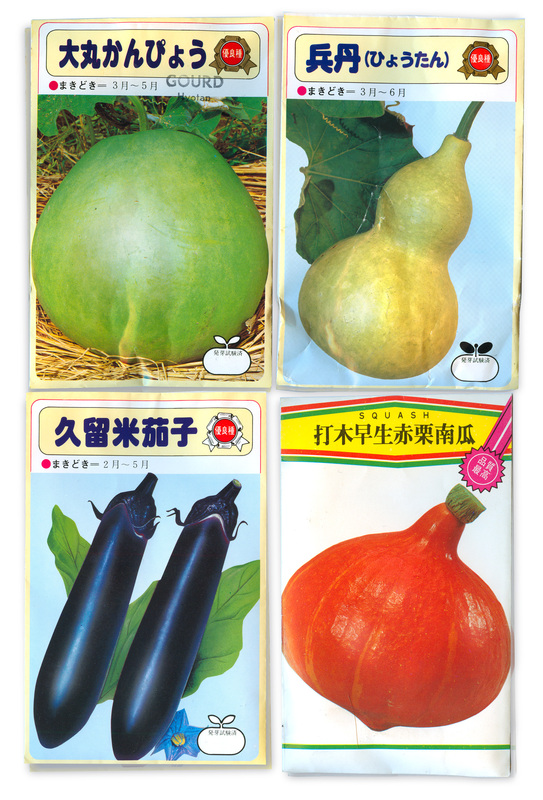 I’d love to see your Smalls packets … I have a vague recollection of her gardening column. How great that you found inspiration from her and still remember it.